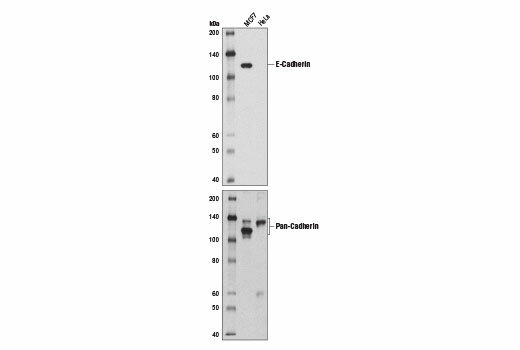 Western blot analysis of extracts from various cell types using E-Cadherin (4A2) Mouse mAb. Western blot analysis of extracts from MCF7 (+) and HeLa (-) cells using E-Cadherin (4A2) Mouse mAb (upper) and Pan-Cadherin (28E12) Rabbit mAb #4073 (lower). Immunoprecipitation of E-cadherin from MCF7 cell extracts using Mouse (G3A1) mAb IgG1 Isotype Control #5415 (lane 2) or E-Cadherin (4A2) Mouse mAb (lane 3). Lane 1 is 10% input. 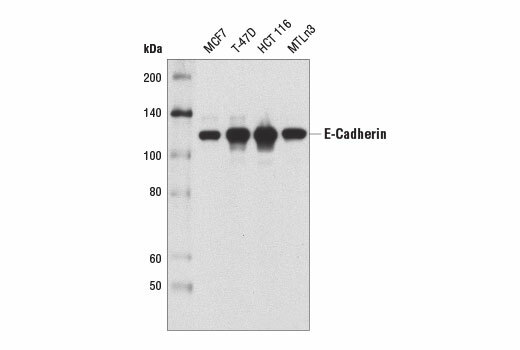 Western blot was performed using E-Cadherin (4A2) Mouse mAb. 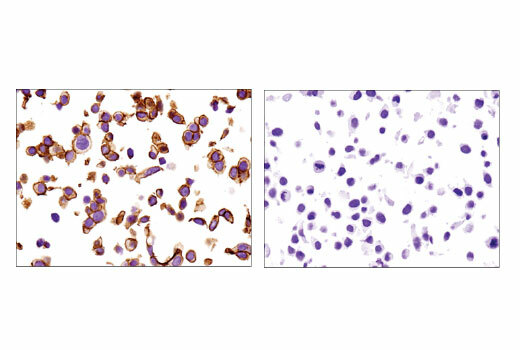 Immunohistochemical analysis of paraffin-embedded human non-small cell lung carcinoma using E-Cadherin (4A2) Mouse mAb. 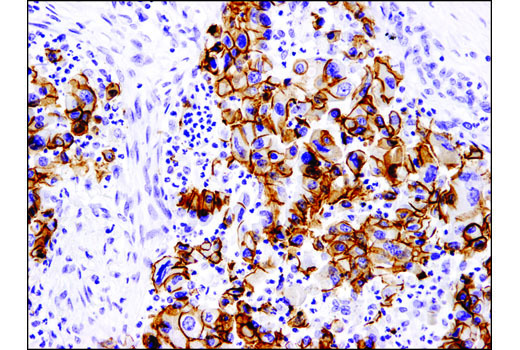 Immunohistochemical analysis of paraffin-embedded human endometrioid adenocarcinoma using E-Cadherin (4A2) Mouse mAb. Immunohistochemical analysis of paraffin-embedded MCF7 (left) and HeLa (right) cell pellets using E-Cadherin (4A2) Mouse mAb. 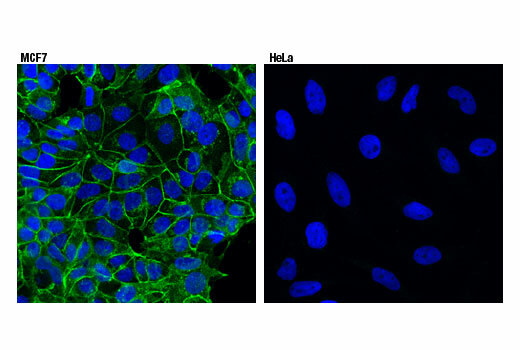 Confocal immunofluorescent analysis of MCF7 (positive, left) and HeLa (negative, right) cells using E-Cadherin (4A2) Mouse mAb (green). Blue pseudocolor= DRAQ5® #4084 (fluorescent DNA dye). Flow cytometric analysis of HeLa cells (blue) and MCF7 cells (green) using E-Cadherin (4A2) Mouse mAb. 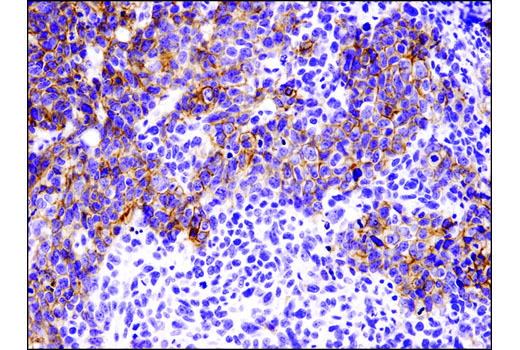 Anti-mouse IgG (H+L), F(ab')2 Fragment (Alexa Fluor® 488 Conjugate) #4408 was used as a secondary antibody. 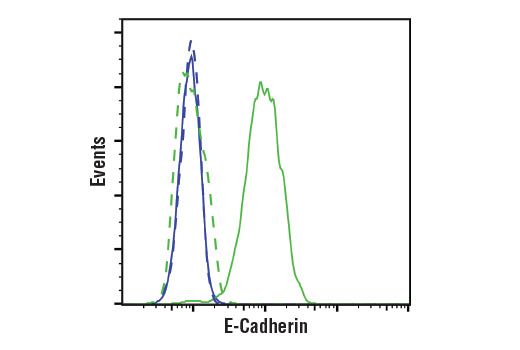 E-Cadherin (4A2) Mouse mAb recognizes endogenous levels of total E-cadherin protein. 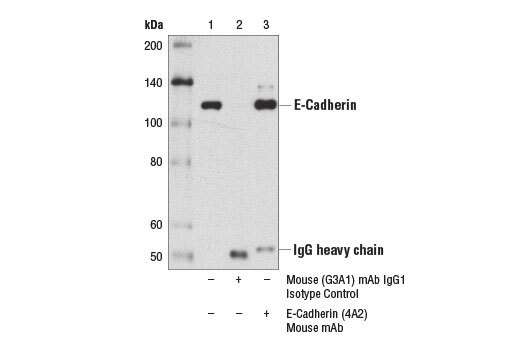 This antibody does not cross-react with other cadherin proteins.